Well, we have some splendid news to confirm in this post, friends. As some of you will be aware through various channels (including the We Are Chester Flipside Radio show, 6th July), We Are Chester’s very own James Wright has been promoted to Deputy Editor (thanks again, Angela). Now then, if you’re still with us, I recently went to see a Tip Top Productions performance of Steve Thompson’s Whipping It Up, a political satire that could not have come to our fair city at a better time really. With the EU Referendum, the Trump Administration, and the General Election fall-out, all of it and more almost feels like a comedy at times (especially when a certain Conservative MP who famously zip lined over the River Thames appears on the screen). However, as we are told in Whipping It Up; when it all comes down to it, the men and women running the country are only the faces. The real power lies with the Whips, the individuals whose responsibilities include getting the other members of their party to vote, and to vote the way their party wants. And that’s something that Whipping It Up deals with. 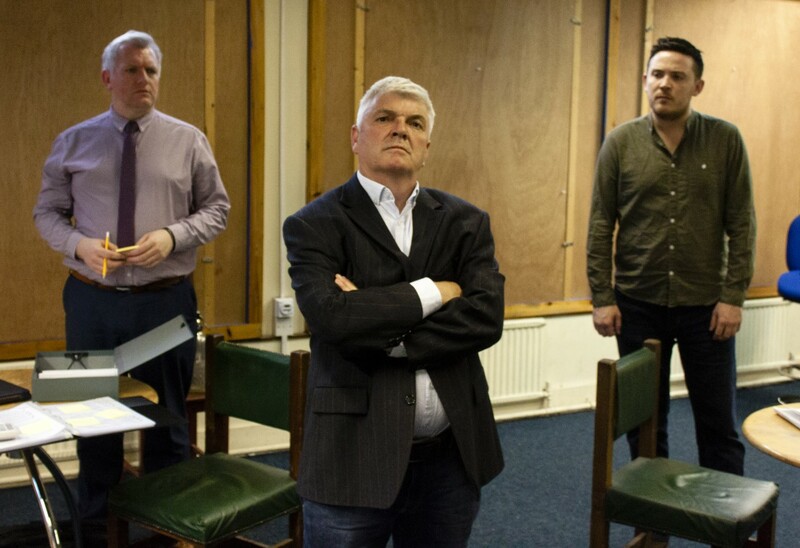 A small group of Conservative whips; Alastair (played by Simon Phillips), Tim (played by Des Hinks), and The Chief (portrayed by Richard Taylor) need to fight a controversial Bill being passed through. Added to this threat, there’s the fact that some members of the party are willing to defect to the Labour party, including Guy (portrayed by Conor Collins). To get through to these rogues, the Whips are willing to take (and certainly will do) anything – sorry, anything – to make sure order and loyalty to the Party is kept. The results are hilarious, and darkly so at times, with some political themes and terminology utilised to give credence to the pranks, jokes, and cocksureness of the Whips. The cast works well together, with Simon Phillips and Des Hinks; Hinks and Richard Taylor; and Taylor and Phillips all working tremendously well in unison. From the slight gestures including the raise of an eyebrow here, or tap of the foot there, to the twisted banter between them, every part is funnier than the one that came before it. A comedy that The Daily Telegraph once referred to as “the sharpest new comedy of the year”, and as the Sunday Times described as “a vitriolic political comedy that makes the average alligator pond look like a health spa,” Whipping It Up is a must see performance that I whole heartedly recommend you see, regardless of your political persuasions. Tip Top Productions, located at the Chester Forum Studio, between the Crowne Plaza, the Chester Indoor Market, and the old bus station, proudly presents Whipping It Up by Steve Thompson and directed by Dan Ellis. Performances run until Saturday 8th July, with showings at 7:30 on all days and a matinee performance on 8th July at 2:30. Tickets cost £11 (concessions priced at £9), with matinee tickets costing £7. For booking, contact the Forum Studio Box Office on 01244 341296, or alternatively here. Review by James Wright. You can read more about James and the rest of the We Are Chester team here. Good review James, but no mention of the excellent performances by the two female actors. Did you not notice them?